Wait a minute! I do not need an old hotel to inspire my horror stories – I am a marketing researcher! If you have spent any amount of time in marketing research, you know that we all have stories of projects gone wrong, misguided clients and wacky respondents. Here, just in time for Halloween, are some tales from earlier in my career that are certain to bring chills to your spine and to make your hair stand on end (or at least give you a chuckle). The Case of the Missing Surveys: I knew it was trouble from the moment I answered the phone that Friday morning. The manager of one of our divisions wanted some research done on a new marketing program he was considering. Of course, he did not have any budget for research. What he wanted was for me to pull together a brief questionnaire and then provide some analysis and a report. He would have his customer service reps collect the data over the weekend and would send me the results on Monday. I told him they needed to complete 100 surveys, which he assured me was a piece of cake. Reluctantly, I agreed. On Monday, when I got to the office, the surveys were waiting for me (pre-Internet, they were on paper). As I began to enter the data into a spreadsheet, I noticed that the answers seemed to be repeating very – regularly. Moreover, when I looked at the surveys, they seemed to have similar stray marks and stains. In fact, they looked remarkably similar! In fact, there were only ten original surveys; the manager had copied each of them ten times since I told him we had to have 100 completed surveys. (I should have been more precise and said 100 individual respondents.) Needless to say, I got called on the carpet by my boss for (1) taking on the project and (2) not telling her what I was doing. That wasn’t too bad – the manager got fired for fraud! The Mystery of the Ignored Results: We were introducing a new product, and I was asked to conduct pricing research to determine the best price to charge. The answer came back that we should price the product between $90 and $120. I wrote the report and presented the findings to the product manager. A few weeks later, I found out that we had introduced the product – at a price of $325! Apparently, the optimal price from the research did not cover the costs of producing the product. So rather than walk away from a doomed situation, we launched the product at a price more than three times higher than the one recommended in our research! Needless to say, the product did not sell to expectations. However, I was surprised when the product manager called me again to request more research! This time, he explained, he wanted to find out what was wrong with the advertising. If sales were not where they needed to be, there must be something wrong with the advertising, right? Right! So I asked him if he had included the $325 price point in his advertising. Of course, he did! Well, I explained, that is what is wrong with your advertising! No further research necessary. That Case of the Invisible Participants: We were conducting focus groups in Memphis, and we needed a very particular participant. They were IT managers, who worked in a specific part of Memphis, who had a certain number of years of experience, and who used a particular product. So, a very difficult group to recruit. However, the focus group facility assured me that they could do it and said that they got it done. The subject matter was very important to the company, so, we had four key managers from our Memphis office, three executives from our Corporate office (who flew in just for this event), and three people from our marketing department (including me). Ten people in the back room, all waiting for the focus group to begin at 6PM. The minutes passed. Is anyone here? Has any of the participants shown up yet? At 5:55, we have one participant. At 6:00, still one. At 6:05, the second participant arrives, blaming his lateness on traffic. At 6:10, we are still at two participants. At 6:15, we decide to start, hoping that other participants will join as they arrive. And then the unthinkable happens: as we are doing introductions, it becomes clear that one of the participants is not really qualified, and we have to excuse him. We all watch the moderator and our last participant through the mirror. It finally comes down to having hundreds of thousands of dollars in executive talent sitting in the dark watching what has become an in-depth interview! Not great for my reputation. But at least we enjoyed the Memphis barbecue. The Mystery of the Exploding Bottle: We were conducting a packaging test in three major markets, trying to get information on which new bottle shape was most preferred for appearance, how it fit into the refrigerator, and pour-ability. We recruited respondents, mostly women, to central location facilities, and asked them to use the bottles and then to evaluate them. The bottles, unfortunately, were only prototypes, so they kept springing leaks that we would have to fix with a kit the developers sent. However, as one respondent removed the bottle from the refrigerator and walked over to the table, the bottle simply exploded! And did I mention it was full of grape juice? Needless to say, our project costs were slightly inflated by the cost of paying to dry-clean the respondent’s clothes as well as the focus group facility’s carpets and drapes! Fortunately, all of these horror stories have a minimum of blood and gore and, for the most part, they have a happy ending. However, horror stories are what we at Infosurv Research avoid at all costs. We’d much rather deliver brilliant insights that help you see new opportunities – rather than ghosts! 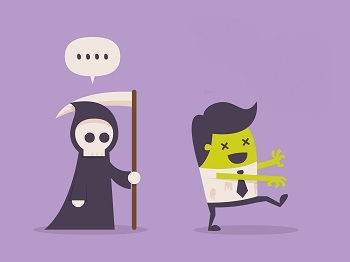 Care to share any of your marketing research horror stories?